There are no general statewide prohibitions as to the open carry of many knives. However, it is illegal under Virginia law to possess, sell, offer for sale, furnish or give away any switchblade knife or ballistic knife. § 18.2-311. Prohibiting the selling or having in possession blackjacks, etc. If any person sells or barters, or exhibits for sale or for barter, or gives or furnishes, or causes to be sold, bartered, given or furnished, or has in his possession, or under his control, with the intent of selling, bartering, giving or furnishing, any blackjack, brass or metal knucks, any disc of whatever configuration having at least two points or pointed blades which is designed to be thrown or propelled and which may be known as a throwing star or oriental dart, switchblade knife, ballistic knife as defined in § 18.2-307.1, or like weapons, such person is guilty of a Class 4 misdemeanor. The having in one’s possession of any such weapon shall be prima facie evidence, except in the case of a conservator of the peace, of his intent to sell, barter, give or furnish the same. Virginia provides that specific types of knives may not be carried in a concealed manner. 10. Any judge or justice of the Commonwealth, wherever such judge or justice may travel in the Commonwealth. 5. Harbormaster of the City of Hopewell. A. If any person knowingly possesses any (i) stun weapon as defined in this section; (ii) knife, except a pocket knife having a folding metal blade of less than three inches; or (iii) weapon, including a weapon of like kind, designated in subsection A of § 18.2-308, other than a firearm; upon (a) the property of any public, private or religious elementary, middle or high school, including buildings and grounds; (b) that portion of any property open to the public and then exclusively used for school-sponsored functions or extracurricular activities while such functions or activities are taking place; or (c) any school bus owned or operated by any such school, he shall be guilty of a Class 1 misdemeanor. B. If any person knowingly possesses any firearm designed or intended to expel a projectile by action of an explosion of a combustible material while such person is upon (i) any public, private or religious elementary, middle or high school, including buildings and grounds; (ii) that portion of any property open to the public and then exclusively used for school-sponsored functions or extracurricular activities while such functions or activities are taking place; or (iii) any school bus owned or operated by any such school, he shall be guilty of a Class 6 felony. C. If any person knowingly possesses any firearm designed or intended to expel a projectile by action of an explosion of a combustible material within a public, private or religious elementary, middle or high school building and intends to use, or attempts to use, such firearm, or displays such weapon in a threatening manner, such person shall be guilty of a Class 6 felony and sentenced to a mandatory minimum term of imprisonment of five years to be served consecutively with any other sentence.The exemptions set out in §§ 18.2-308 and 18.2-308.0161 shall apply, mutatis mutandis, to the provisions of this section. The provisions of this section shall not apply to (i) persons who possess such weapon or weapons as a part of the school’s curriculum or activities; (ii) a person possessing a knife customarily used for food preparation or service and using it for such purpose; (iii) persons who possess such weapon or weapons as a part of any program sponsored or facilitated by either the school or any organization authorized by the school to conduct its programs either on or off the school premises; (iv) any law-enforcement officer, or retired law-enforcement officer qualified pursuant to subsection C of § 18.2-308.0162; (v) any person who possesses a knife or blade which he uses customarily in his trade; (vi) a person who possesses an unloaded firearm that is in a closed container, or a knife having a metal blade, in or upon a motor vehicle, or an unloaded shotgun or rifle in a firearms rack in or upon a motor vehicle; (vii) a person who has a valid concealed handgun permit and possesses a concealed handgun while in a motor vehicle in a parking lot, traffic circle, or other means of vehicular ingress or egress to the school; or (viii) an armed security officer, licensed pursuant to Article 4 (§ 9.1-138 et seq.) of Chapter 1 of Title 9.1, hired by a private or religious school for the protection of students and employees as authorized by such school. For the purposes of this paragraph, “weapon” includes a knife having a metal blade of three inches or longer and “closed container” includes a locked vehicle trunk.As used in this section:”Stun weapon” means any device that emits a momentary or pulsed output, which is electrical, audible, optical or electromagnetic in nature and which is designed to temporarily incapacitate a person. 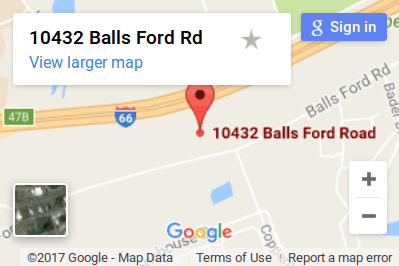 Our main office is conveniently located next to the Fairfax Judicial Center. 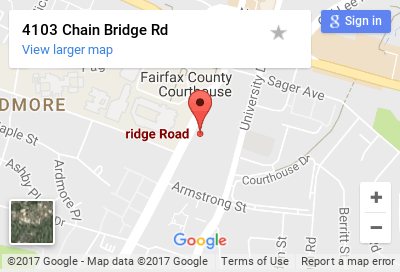 Our location provides free parking and a short walk to the Fairfax County courthouse. DISCLAIMER: Use of email or SMS does not create an attorney-client relationship and information transmitted will not necessarily be treated as privileged or confidential. Do not send us any information regarding any current or potential legal matters unless you have a written statement confirming our engagement by you as your legal counsel.